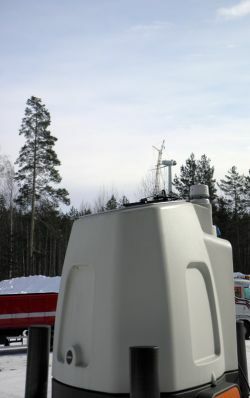 TuuliSaimaa develop wind farms in Finland and have been working with ZephIR lidar systems over many years. This novel application sees the company using ZephIR 300, the industry leading wind lidar, to monitor wind speed at the under construction 21 MW Muukko wind farm in an area approximately 8 kilometres east of the city of Lappeenranta in Finland. ZephIR 300 provides wind measurements up to 200 metres from installed level and importantly down to just 10 metres providing TuuliSaimaa with the confidence required on all operational decisions regarding the safe lifting of turbine components during the sites construction. Consented in 2011, the Muukko project began construction in summer 2012 and ZephIR has supported all works with the wind farm now nearing completion. TuuliSaimaa purchased their ZephIR 300 due to the high flexibility in operations available  the company have used ZephIR in a number of other applications already including long and short term wind resource assessment. The Muukko project, registered as the company TuuliMuukko Ky, began in late 2009 and received final building permits in 2011. Finnish insurance and banking company LähiTapiola owns 90 % of TuuliMuukko, and TuuliSaimaa owns the remaining 10 %. The project consists of 7 Alstom ECO110 wind turbines in Muukko, an area approximately 8 kilometres east of the city of Lappeenranta. TuuliSaimaa develops wind power projects in Finland, with approximately 300 MW in the development pipeline. Core competences of TuuliSaimaa include procuring suitable areas for wind power, permission procedures, planning and execution of the projects. Visit www.tuulisaimaa.fi/ for more information.